My Time At Batis one man’s tale of success in a career where the odds were clearly not in his favor—in Major League Baseball. 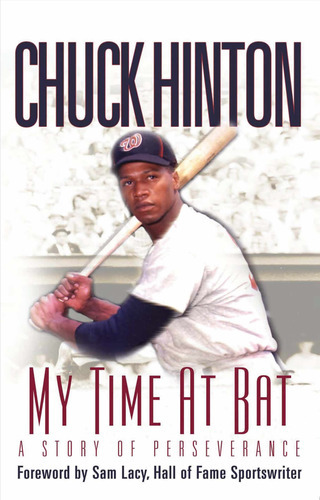 Chuck Hinton takes us down the road to the big league, over every bump and hurdle along the way. He took a chance and hitchhiked 300 miles for a baseball tryout and made it. He reveals his secrets about how he stayed there for eleven years. But this book offers much more. Chuck Hinton persevered just as much off the field. He offers many principles to live by that will benefit everyone, male or female, in any walk of life. After all, it was important to him to be more than a Major League player. He strove to be a Major Person in everything he did. In the early ’60s, he led the Senators in batting three out of the four seasons he played for the team. He also led that team in stolen bases and triples all four years. His Minor League career highlights include 1959 Rookie of the Year, back-to-back league batting championships and league Most Valuable Player. As you embark on his journey, you will see what it was like to be in the Major Leagues—and what it took to stay there. With the book’s behind-the-scenes stories, words of encouragement and life lessons, this book is sure to be a hit for players and fans alike.